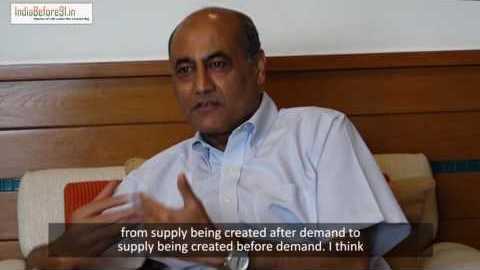 R V Kanoria, Chairman and MD of Kanoria Chemicals, and Past President of FICCI, discusses how import tariffs were lifted, the pressing need for economic freedom and competitiveness, and the absurd regulations in place to correct a defected piece of machinery. He argues that over-regulation breeds malpractices. Between 1991 and 1996, in my opinion, was the true transformative years for the Indian economy. I mean, there were some very fundamental decisions taken at that time. Basically, I’m limiting myself to three. One is, doing away with industrial licensing, which means allowing industry to be set up wherever it was naturally meant to be set up and by not limiting it to saying that you have to set it up in the constituency of a particular MP or an MLA. So, I think fundamentally we moved away from planning as to where industry should come up without consideration for whether it is economical or not, to allowing industry to be set up in the place where it was most economic and made the most sense.The second was that by and large, we did away with import controls. So, I mean, what was being followed earlier was that in order to protect domestic industries, import tariffs were kept at very high levels and there was physical controls on imports. So those physical controls were removed, and the tariffs were reduced substantially. I mean, we used to have triple digit tariff on imports. And they were all brought down to the maximum of 40 percent. And later on, slowly and slowly, I mean as of today, our average tariffs are below ten percent, so it’s around 9 plus. So, this tariffs was dismantled and the instrument which was used was that the rupee was devalued. So the rupee was devalued from about 14 rupees something, 14.70 something to the dollar, to 31 rupees, 50 paise to the dollar, and simultaneously the import tariffs were reduced. So in some way the protection to domestic industry was maintained but in a limited way. So this import controls were done away with and the import tariffs were reduced. In my opinion this fostered competitiveness in the economy. First of all, it allowed competition to breed. Because of no licensing, we moved away from supply being created after demand to supply being created before demand. I think fundamentally we shifted away from an economy of shortages to an economy of surpluses. Or surpluses may not be the right word to use but at least it allowed competition to come in. And by removing these import controls and import tariffs, first of all it improved the ease of doing business. I’ll give an anecdote. Suppose a PCB on a machine went out of order. Then we had to first advertise in the Indian Trade Journal. Then in the Indian Trade Journal we had to leave that for two months. Any domestic manufacturer, if they said that we are capable of supplying this to you, then we were obliged to first give the domestic manufacturer a chance, and if, within two months, if there was no response to it, only then we could import. Now which meant that all this time, the machine whose PCB has gone out of order remains idle. So what do you do in that circumstances? I mean, the best thing to do was that a PCB is a very simple part, I mean; you can put it in your suitcase and bring it… So, I mean, my point was that it was really fostering wrong ways of doing business because it was completely impractical to have that kind of control.